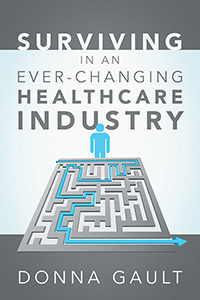 Surviving in an Ever-Changing Healthcare Industry is a short book that packs a powerful punch. Donna Gault, a registered nurse with nearly 50 years of experience, explains the many changes in the healthcare industry today and the challenges facing doctors, nurses, hospitals, and especially you—the patient. She then provides guidelines to help everyone obtain safer healthcare. The book includes sections written by two physicians who offer their own viewpoints on the changes facing physicians today, and how to help doctors provide the best care for you. Donna Gault is a registered nurse who graduated in 1965 from the St. Elizabeth School of Nursing and worked full time for 48 years. For more than 20 years, she worked in a busy trauma-centered emergency department as staff nurse, then shift leader. She worked in cardiac, medical, and surgical intensive care units. She has been a staff nurse, a hospital supervisor, an oncology nurse coordinator, a utilization review nurse, a home care nurse liaison, nurse case manager, and admission nurse for hospice. Donna is retired now and lives in Ohio, where she enjoys spending time with her children and grandchildren and her little dog, Sugar.